Overlooking the Firth of Clyde, The Pine House is a distinctive local landmark in the village of Fairlie on Scotland’s west coast. 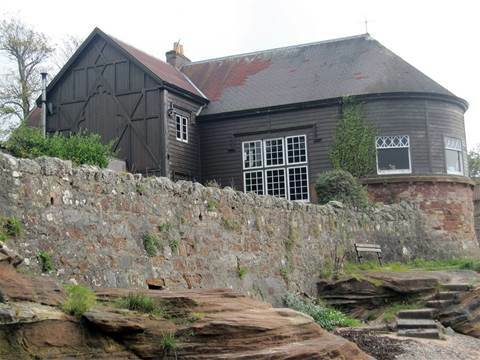 It was constructed in 1895 as an artist’s studio, when it was known simply as the ‘The Hut’. 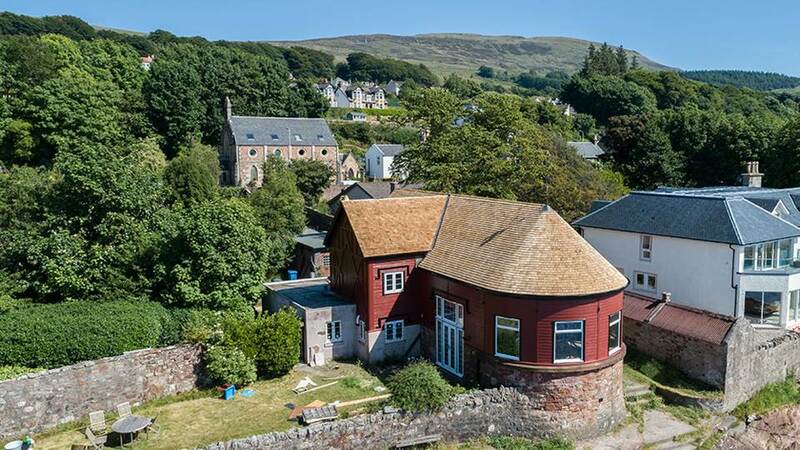 Built by workmen from the famous Fife Boatyard, the timber-clad building, with its curved end, echoes the fishing boats that once plied the area. 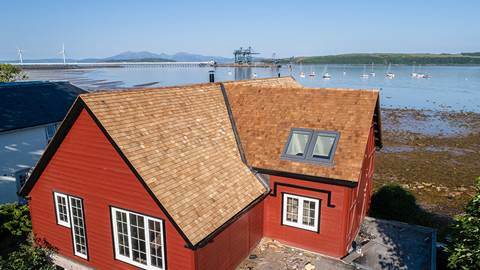 However, the building needed urgent renovation, including to its roof, which presented DM Roofing & Roughcasting Ltd, with an opportunity to use a distinctive cedar shingle roof covering, which enhanced the building’s nautical feel and withstand challenging weather conditions. Despite being in continuous occupation for the past 118 years, the building lacked insulation in the roof, walls and floors, so there was a need insulate the home to a decent U value. 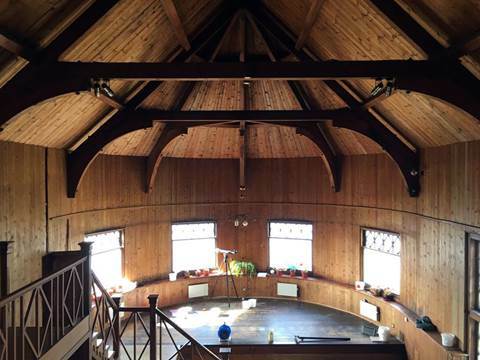 DM Roofing & Roughcasting therefore had to prepare the roof for applied sprayed insulation externally, but also internally to the timber walls, which with its exposed trusses crafted by carpenters from the local yacht builders, was reminiscent of a church. The roof had been re-clad some years previously with felt shingles but had struggled to withstand the elements. DM Roofing & Roughcasting, therefore, proposed cedar shingles which would meet the requirement for a lightweight covering that was aesthetically pleasing, as well as suitable for working round the sweeping curved roof. Working closely with McMillan and Cronin Architects, the team specified the best shingle to use in extreme coastal environments, following advice from the Canadian Cedar Shake and Shingle Bureau. The external insulation was fixed to all the lower rendered walls and rendered once again, leaving a clean fresh external appearance. The existing roof finish was mineral felt tiles, and these were replaced by cedar shingles on a fully insulated built up roof construction. Few roofing projects use cedar shingles, and this was a first for DM Roofing & Roughcasting, which specialises in commercial work, however, the team used the same principles for roof slating, especially for covering the curved part of the roof to an excellent standard. It also provided a chance to expose the two apprentices to a unique project and provide them with new skills. Located as it was on the west coast of Scotland, access to the site as well as adverse weather conditions, were always going to be factor, which the team overcame to install an outstanding new roof. This is probably our most memorable job and it was a real labour of love. Everyone worked closely together, from the hands-on client, sanding down the exterior paintwork, to the local architect with a vested interest in restoring a much-loved and architecturally important building in his home village. The team quickly realised after fixing the first few metres of shingle that this was going to be something a bit special. DM Roofing & Roughcasting Limited is a family owned construction company specialising in the external refurbishment of buildings across West and Central Scotland. Established in 1992, our 20-year track record spans a variety of building types and a range of market sectors, including housing developments and prestigious listed buildings.